Well, VdS Alorah (FF Dinamico x FF Amberina) has been in training for a month now and doing so well!!! She’s going to be a fabulous trail horse. Looking forward to foals in 2018! 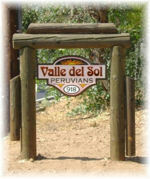 Thank you for your interest in Valle del Sol Peruvians! We are glad you stopped by to visit and do hope that you'll leave us a comment and share your thoughts and feelings about this wonderful breed of horses. If you have information that you think would be beneficial to this site or websites you'd like us to link to, please let us know! Would you like to link to Valle del Sol Peruvians? If you would like to use a graphic to link to us, we will be posting one shortly for you. Again, thank you for stopping by and please let us know how we may be of service to you. Sharing our passion with others is a true joy for us! Click on the photo to email Debby for more information!